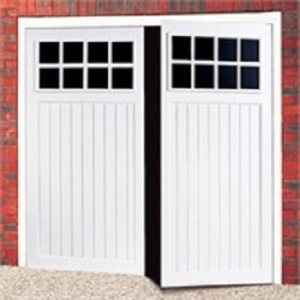 Side-hinged garage doors give a garage a traditional look with easy personal access. Available pre-framed in standard and made-to-measure sizes in a range of colours and laminate woodgrain effects. 50/50 split and 2/3:1/3 door opening options are available. 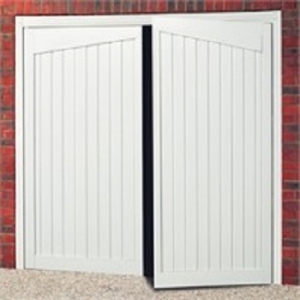 Garador and Cardale side-hinged garage doors in steel offer convenience in function, good looks and competitive prices. Garador construct their doors using secret welding techniques for a seamless and strong door leaf construction. Cardale use barely visible rivets. 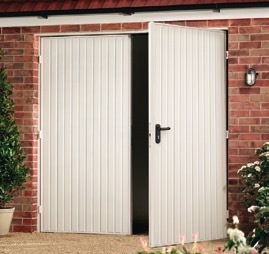 Both brands pre-install the door leaves to a fixing frame in the factory, facilitating quick and easy on-site garage door installation. Internal shoot bolts top and bottom on the inactive leaf. Mortice sash lock on the active leaf. Various other models available. 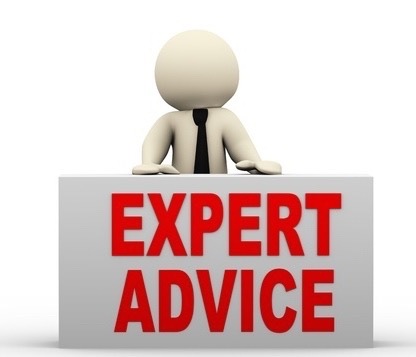 See on-line brochures for full range. 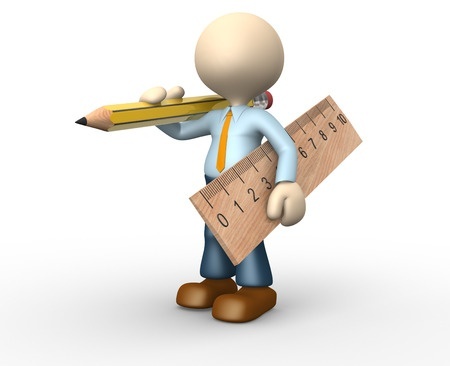 Lead time 2-3 weeks (Cardale), 3-5 weeks (Garador). Right hand door leaf opens outwards first; left hand on request, at minimal extra cost. All doors open outwards. Doors and frames come colour matched. 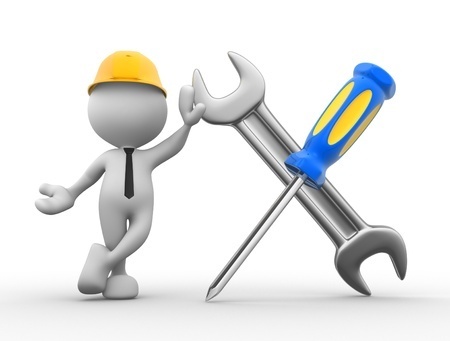 10 years manufacturer's safe and reliable guarantee. 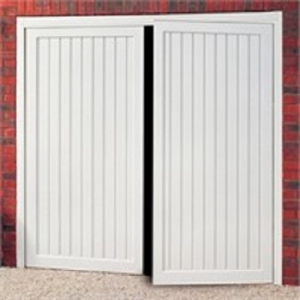 Steel side-hinged garage doors - features explained. How many garages have a car in them? 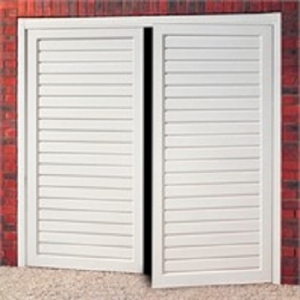 When used for storage, as a utility room, workshop or home gym it is often more convenient to have side hung garage doors. When popping in and out on foot they are quick, light and easy to use and do not open the whole garage for the world to see. 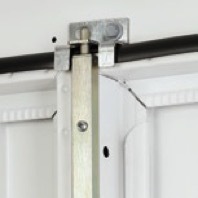 By opening outwards they maximise storage and work space in the garage and top and bottom shoot bolts on the fixed leaf are quickly released when the whole door needs to be opened. 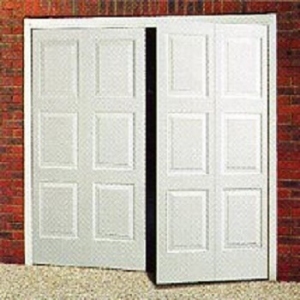 Door stays are available to hold the two doors fully open preventing the doors being blown over open or slammed shut in the wind. 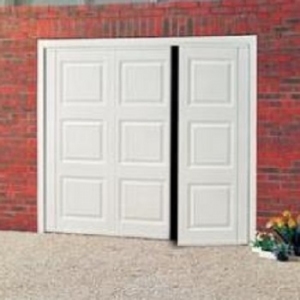 Steel side hung garage doors are commonly available in widths from 5ft wide to 8ft wide. 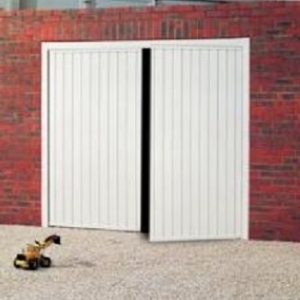 To view details on side hinged steel garage doors over 8ft wide and upto 12ft wide click on this link. 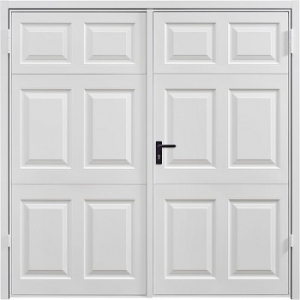 The two door leaves are pre-fitted to a steel goalpost fixing frame in the factory with shoot bolts, locks and weather seals also pre-fitted to ensure quick straightforward installation of the door. 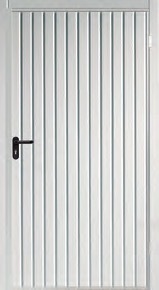 The pressed steel door leaves are made from galvanised and powder coated steel. Each door leaf has a perimeter chassis with bracings on the back ensuring lightness of weight coupled with strength and rigidity. 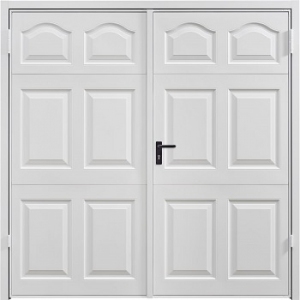 The door leaves are fitted to the steel frame via matching steel hinges, factory riveted to minimise “play” in the door and “door drop” often associated with side hinged doors. Steel hinges factory riveted to door and frame. Weather strips at sides and top. 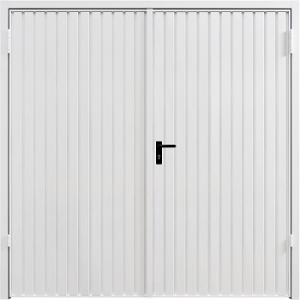 Centre stile increases security and draught proofing. Top and bottom shoot bolts secure the fixed leaf. 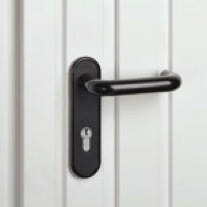 Lever handle with a profile cylinder lock included. Steel side hung features explained. Centre style. The centre style on the Garador active leaf overlaps the fixed leaf increasing security by minimising the opportunity to lever the two doors apart. 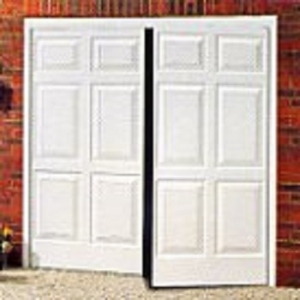 The integral sound absorbing seal also reduces noise when closing the door. Weather strips. 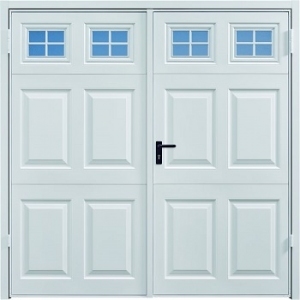 Neat black weather strips fitted around 3 sides of the door help prevent draughts and debris blowing into the garage. Steel shoot bolts, top and bottom, on the fixed leaf secure the door. Lever handle. 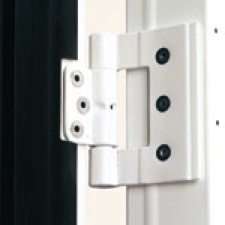 A sash mortice lock fitted onto the active leaf latches and locks the two door leaves in the centre. Activated by means of an ergonomically designed lever handle the door can be opened, closed, locked and unlocked from inside and outside. Upgrade to Brass, Chrome or Brushed Stainless Steel handles is available on request. 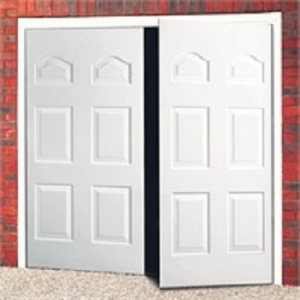 For timber side hinged garage doors click on the link, or insulated side hinged garage doors, which have additional benefits. GRP, glass fibre side hinged garage doors are all made to measure, and available in numerous designs and woodgrain colours. 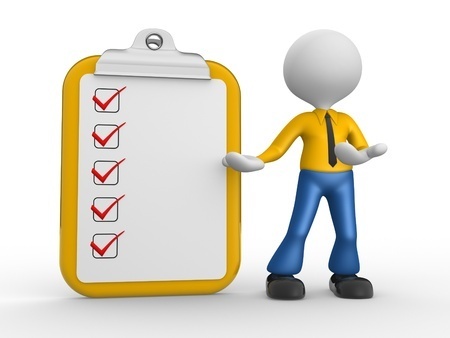 You may prefer to send us your garage opening sizes and questions using our convenient self survey form. We look forward to hearing from you. 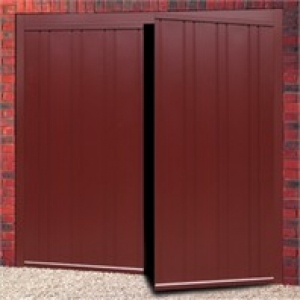 The convenient and well priced Garador Carlton side hinged door. CLICK ON THE PHOTO TO SEE PRICES.